The adapters are designed to fit almost every type of DSLR camera and most common tripods. 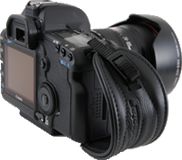 With a pin connection on the mounting plate, they allow for the attachment of the Hand Strap, as well as a neck strap and tripod, without blocking access to the battery or media card compartments. The adapters are made of satin black anodized aluminum for strength and reliability. The Adapter has an optional neoprene base, and it fits XT or Plus systems, making it possible to work with a variety of camera and tripod pairings. The newest addition is an L-Plate Adapter for an Arca or Manfrotto tripod system. This allows the photographer to mount the camera vertically or horizontally, while still allowing access to the camera connections and controls. To find the perfect fit for your camera and tripod system, refer to our Compatibility Chart.